The most energetic electrons are confined to two belts around Earth. 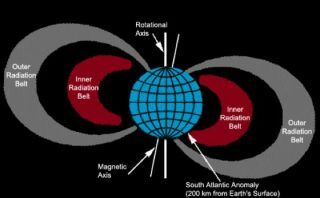 These Van Allen Belts have now been found to be related to solar weather. A team of Montreal university students will aim for space as soon as next year after winning the Canadian Satellite Design Challenge on Saturday (Sept. 29). When launched, Concordia University's CubeSat will aim to map plasma changes in a portion of the Van Allen belts, which are bands of intense radiation circling the Earth. The prize is worth at least $300,000 in launch costs; in-kind contributions are also provided to shepherd the satellite through the final stages of development. Negotiations are ongoing with the European Space Agency and other entities for a launch date, but the students expect to be in space sometime between 2013 and 2014. Concordia University's satellite will map a portion of the Van Allen belts. "Experiential learning is absolutely critical for students. It's so key that we get our hands dirty and work on projects. Otherwise, we're passively learning and we don't learn as much," Sweet told SPACE.com. Concordia's satellite will orbit between 373 and 497 miles (600 to 800 kilometers) above Earth and focus on the South Atlantic Anomaly, a spot where the Van Allen belts stretch close to Earth's surface. The Anomaly exposes satellites in the area to higher-than-normal levels of radiation, putting the machines at risk of shorting out vital electronics. The team plans to map the plasma density in that area and overlay the data on a Google map, allowing a near real-time view of what the Anomaly looks like. The satellite is designed to last at least a year. The CubeSat format it uses is a 12 x 4 x 4 inch (30 x 10 x 10 centimeter) nanosatellite, a configuration commonly used by university departments and other organizations seeking low-cost access to space. Members of Space Concordia. From left to right: Tiago Leao, Tyson Boer, Alex Potapov (crouched), Ivan Ivanov, Shawn Stoute, Gregory Gibson, Stefanos Dermenakis, Scott Gleason (faculty advisor), Michelle Boyce, Nick Sweet, Bill Pontikakis (advisor), Alex Teodor Ionita, Mehdi Sabzalian, and Advisor John Salik. Concordia's design was far more advanced than most of the competition, giving the students an edge as they participated in final tests this week at a Canadian Space Agency laboratory in Ottawa, said a representative from the sponsoring organization. "All points aside, it was very obvious they had the most mature design and spacecraft available," said Larry Reeves, the leader for the Canadian Satellite Design Challenge Management Society. "They were really good with their estimates." The founder of consulting firm Geocentrix started the design challenge two years ago to give more space opportunities to Canadian students. Reeves and representatives from several other firms formed a not-for-profit organization to administer the challenge. The challenge was supported through a combination of grants, in-kind contributions and advice from organizations such as Boeing, MDA, the Canadian Space Agency's David Florida Laboratory and a development branch of the Department of National Defence. Although the university teams were mostly new to space, Reeves said that was a positive because they were untainted by previous experience and thus had innovative ideas for their CubeSats. For example, the University of British Columbia proposed a radio transmitter to calibrate satellite dishes on the ground. "It certainly raised the profile of space and allowed many universities who previously had not done any spacecraft research or development to get involved," Reeves said. While the 15 or so students developing Concordia's satellite were engineers in training, they knew little about space and had to educate themselves quickly. They received some help from faculty advisor Scott Gleason, who is a co-investigator on NASA's Cyclone Global Navigation Satellite System. Team members put in 10 to 15 hours of unpaid work every week for the better part of two years. They learned the fundamentals of satellite design, determined a scientific goal for their mission and manufactured the parts. "One thing that we learned, very hard, is you need to keep it simple," Sweet said. The team cut some secondary payloads from the manifest to save on time, as well as design and testing costs. Only Sweet was paid for his time; he received a summer grant from a national science and engineering council in Canada. The satellite team also received $30,000 from Concordia's undergraduate engineering society for development and travel costs. "They give us so much heart, and they always embarrass me whenever they talk about us. They were so excited when we won," Sweet said. With about 1.5 years left in his degree, Sweet plans to establish a greater space engineering presence at Concordia on the back of the team's win. Space Concordia has added a new rocketry division, and the society is recruiting students in journalism, business and other faculties as it expands. The organization also plans to apply to the next Canadian Satellite Design Challenge. Geocentrix's Reeves says more details should be available on that in the coming months. This story was updated to correct the name of the satellite-building group Space Concordia.